Rev. Don Ross, in the opening remarks of his sermon two weeks ago at Westminster made a statement that particularly caught my ear: “When I was a child, the duty of our Church, (which was still young and enthusiastic at that time,) was seen to be, not primarily the formation of Christian people, but the formation of good citizens. Respectable, law- abiding contributors to the well-being of the nation.“To expand slightly on Don’s remark-we saw ourselves (Presbyterians, at the time) as the sure foundation on which the future of Canada rested. WASP wasn’t just a word; it was a mission. The declining interest of young people in Church was, we determined, lax parenting. Westminster’s Session and Sunday School staff attacked the issue directly. Parents were enjoined (with the full majesty of the Church) to ensure that their children attended Sunday School regularly. It was not simply an interesting experience, the Bible stories, the singing of songs. It was the place where the children’s and young peoples’ spiritual growth must take place for the well being of themselves, the Church, the Country. Attendance was kept regularly and reported to Session. Parents were contacted where absences were noted. The children themselves were encouraged to build up their regular attendance ( with an undercurrent of competition with their peers). Stickers were given. End-of-year graduation and prizes for perfect attendance were important. As Westminster worked to heighten parents’ cooperation in getting the children to the Children’s Church in the morning and to Sunday School in the afternoon the wider Church ( particularly the Presbyterian and Anglican denominations) worked to heighten parents guilt for not paying attention to their responsibilities in encouraging their children’s spiritual development. Mothers and fathers were reminded that their influence in this area in their homes was every bit as important as the Church’s in its Sunday Schools. The general concern about “leakage” fell especially on teenage boys who, it was felt, saw the church ( from the perspective of their ages) as an institution for women, girls and “little boys”. Fathers were lectured for neglecting their influence as role models. They should attend Church more regularly. They should pay less attention to their business work and more to their sons. No question about it, if early 20th century Canadian parents had any doubts about parenting, the Protestant church had the answers they needed! Beyond the noise, haranguing, and guilt-giving there were reasonable answers to the issue of teenage children’s losing interest in traditional religious pursuits. And there were reasonable people exploring the options that were open to them. In Part two of this article which will appear towards the end of May we will look at one option, Tuxis Boys and C.G.I.T, another, Boy Scouts and Girl Guides, and a third, team sports; what was needed were programs of spiritual development mixed with physical development for both girls and boys. But we needed a gymnasium — from your 125th Anniversary Committee. Patricia G. Dirks is an Associate Professor in the Dept. of History at Brock University. She studies religious/citizenship training programs for children and adolescents in early 20th Century Canada.Her article, alluded to in our article, is entitled Reinventing Christian Masculinity and fatherhood:The Canadian Protestant Experience- 1900-1920. Google will find it for you. Beyond our Sunday classes, junior in the morning during Church service, senior at 3:00 in the afternoon, we were concerned to keep our children in faith based activities on Sunday evening and during the week (especially teen aged children).To do this we adopted the Tuxis Boys and CGIT (Canadian Girls in Training.) programs, names not completely familiar today. More likely we think of Scouts and Cubs, Girl Guides and Brownies programs which Westminster has offered with considerable success to children in the neighbourhood and congregation for several decades. So, what’s the difference between the programs? Why, early on, did we offer Tuxis and not Scouts, CGIT and not Girl Guides? The answer, simply , was Jesus, present in the one set of programs, absent in the other. Lord Baden-Powell was a military man of considerable reputation. His work was in organizing military reconnaissance and scouting in wars against Zulus and Boers in Africa, about which he wrote several books .This experience eventually prompted in him, the idea that young boys might profit from his knowledge. In 1907 he organized a demonstration camp of his ideas. In 1908 he wrote his book, Scouting For Boys. In 1910 he formed The Boy Scouts Association. At his first Scout rally in the Crystal Palace in London in 1909, a number of girls appeared along-side the boys dressed in the uniform. This prompted Baden-Powell’s sister, Agnes, to initiate the Girl Guides program. Her friend, Juliette Gordon Low, imported the Girl Guides program into the U.S. in 1912. As to the basic tenets of the scouting program: “a coherent ideology stressing unquestioning obedience to properly structured authority; happy acceptance of one’s social and economic position in life; and an unwavering, uncritical patriotism” ; these were excellent precepts for training young soldiers for War. But spirituality and the social imperatives that grow from it were totally absent. Jesus wasn’t in the picture. The other programs, Tuxis and CGIT had quite a different birth process and were more in keeping with the values of Canadian Protestant churches Back in the early 1800s a young man, George Williams of Somerset, England, characterized himself as a “careless, thoughtless, godless, swearing young fellow” . After beginning work as an apprentice in a draper’s shop he experienced a conversion and joined the Congregationalist Church. He later worked in London, again as a draper. From his own experience and by observation he became appalled at the conditions under which young men were working and at the activities they indulged in during their leisure hours. To take action against this life style he gathered a group of his fellow drapers together to create a place that would not tempt young men into sin. He called it Young Men’s Christian Association (YMCA), which he founded on June 6, 1844. The tenets which became the basis of his Association are known as the YMCA ’s four-fold program of education: a focus on “physical, educational, social and spiritual growth” . William’s based this set of values on Luke 2:52_”And Jesus grew in wisdom and stature and in favour with God and men.” While the original concept was Christian driven we know the YMCA today as being open to people of all races and religions. The basic program goals remain the same. From this YMCA foundation then arose the development of the Canadian Standards Efficiency Training Program created by Taylor Statten (Boy’s Work Secretary- Canada YMCA). Stratton borrowed from The Y’s Four Fold Program, Physical, Mental, Spiritual and Social well being and added some aspects of the Boy scouts program. Finally, under Statten’s C.S.E.T. 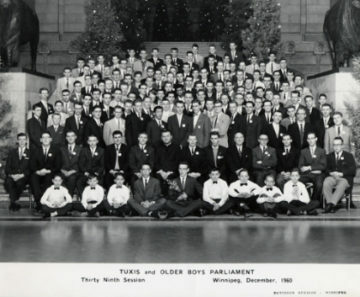 program, TUXIS was established for boys aged 15 to 17. 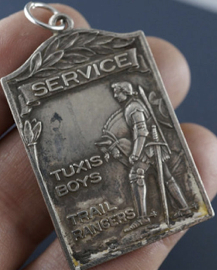 A similar program, Trail Rangers, was developed for boys aged 12 – 14. A parallel program was established for girls, CGIT-Canadian Girls in Training. (The girls’ four-fold descriptors were” Cherish Health, Seek Truth, Know God, Serve Others.”) These programs included midweek activities for Sunday school classes, outdoor activities, and community service. Camping was a significant activity and component of the program. Westminster’s Sunday School adopted these programs to widen its emphasis on spiritual issues as part of a young person’s whole life. In 1925 The United Church of Canada and a number of other Protestant Christian denominations adopted the Tuxis /C.G.I.T. programs. Out of the program Tuxis Boys Parliament events were held during Christmas vacations in a number of provinces. 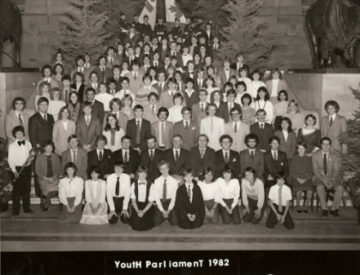 As the Tuxis program declined these Boys Parliaments morphed into Youth Parliaments in which both boys and girls participated — from your 125th Anniversary Committee. As mentioned in the first article of this series read Patricia G. Dirks’ “Reinventing Christian Masculinity and fatherhood:The Canadian Protestant Experience- 1900-1920” Google will find it for you. In the last of this series we’ll mention some of the action around that gymnasium of ours which undergirded all this activities. The year was 1925. Our team was/were the Intermediate Sunday School Basketball Champions in competitions held by The Greater Winnipeg Sunday School Athletic Association. In the back row G. Coulter, C Waldie , R. Gay and A Stewart. In the front row coach, W. Cockburn, J. MacDonald, T MacDonald, A. Thorpe and mentor R.D. Macfarlane. R.D. (we also called him Bert) was Marilyn Huband’s Dad. Besides basketball he and Bill Cockburn were active also in the general sports program of the church held in our gymnasium. For a time we paid Bill $1.50 a night to function as Boys Instructor in the Gym. In 1922 he and R.D. both did the job for free. $2.50 and Edith MacDonald was paid $1.50 a night as Girls’ Instructors . In 1921 we also gave Edith, Sophie Hendry and Hilda Femming each $10.00 cheques for the extra gym service they had given. In 1921 Session was forced to decide that no Sunday School children under the age of 12 could use the gym. (We were charging them $1.00 a season membership.) The call for gym time was too great even though the space was open and used Sunday afternoons and five evenings a week.There was also a problem of noise. Our church’s Christian Endeavour Society complained to Session that their weekly prayer meeting activities were threatened by noise from the gym.For a time we even had to hire a gentleman to supervise noise and activity in the Church halls. From 1912 through to the 1950s emphasis on diﬀerent sport teams and on sport-based activity clubs changed from year to year. The amount of over-all activity was amazing. Yet none of it seemed to lack for enthusiastic membership or capable leadership. The answer to “why” lay in the fact that Westminster Church had a congregation of well over one thousand people. 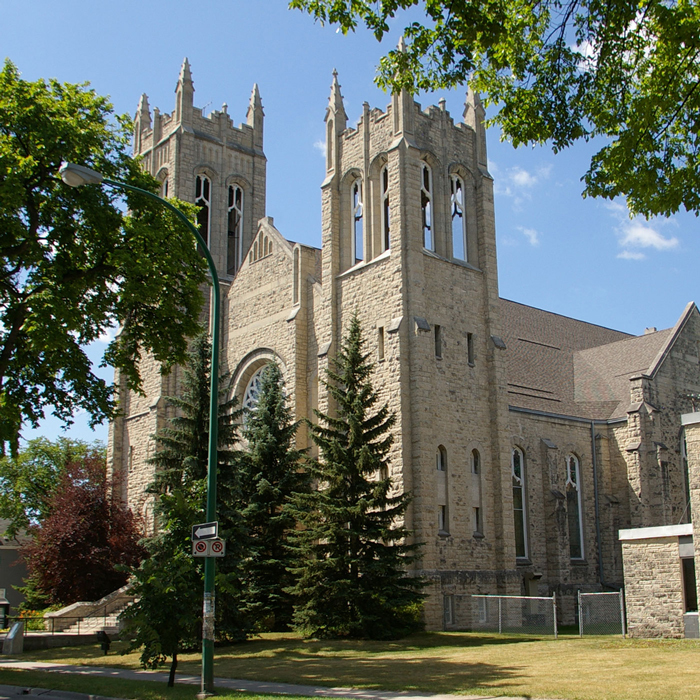 Twelve hundred, fifteen/sixteen/seventeen hundred people in what, for a time, was considered the largest Presbyterian church in Western Canada. And all this physical activity was going on both in our gymnasium and outside the building. A very small sample…..
We had started an indoor Baseball league that was interrupted by WW I but was reorganized in 1919. At that time the Choir agreed to put up a team. We looked for teams to be entered from the Boys Department of the Sunday School, the Young Mens’ Club, the Bible Class. and from the men of the congregation generally. To encourage the fresh start-up Mr. O. B. Knight donated a cup for competition among these indoor baseball players. The games were played on Tuesday and Friday evenings. Our Young Mens’ Club reported in 1913 that, in the line of sport, they, “as usual”, took a prominent part, winning the Hockey Cup, and making what they allowed was a fair showing on the football field . Meanwhile, in another sport, snow-shoeing, it was reported that there had been very little snow the winter of 1912. But during the winter of 1913 there was plenty and the Snow-Shoe Club became very popular. Basketball, baseball, football, hockey, snow-shoeing : in 1919 a tennis club was formed. By 1933 the Westminster Tennis courts ( located at Balmoral and Young) had to be enlarged and improved. Reservations for the membership could be made through V.C. Grant. Later on we would add badminton to our sports roster as well. We also had a church league for bowling (games played Tuesday and Thursday nights at the YMCA). Basketball seems to have been a major obsession over many years. Our gym was equipped with basketball hoops at either end. The size of the court would have been 37’6” by about 15’. Consider that size against what is regarded today as a standard high school court (84 X 50 ft.) The style of play and the overall appearance of the game would only marginally resemble what we see today in the shrines to Basketball where professional NBA games are televised! 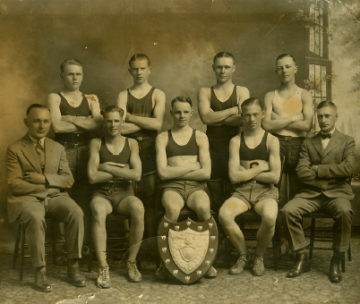 Nevertheless, we had been champions in that sport in 1925 and were still going strong in 1954 when our team, The Westminster Men’s Senior Basketball Team, won the title in the United Church Senior Athletic League. The Junior and Bantam teams both reached the City finals. By the late 1950s the influence of Westminster Church in its congregation’s lives as a place for social and physical activity was waining. Community clubs and other civic activity sites were attracting attention. Swimming pools and bowling alleys were catering to people both “churched’ and otherwise. Public schools were placing more emphasis on Physical Training as we called it and that program would morph to continue as Physical Education to the present day. And who could resist the world of professional sport on radio and television? Does anyone remember the time when radio stations started having women, not just men with their deep, serious, CBC voices, read the news? Were women’s voices right for the solemn business of relaying news events? It was an open question for awhile and then we all settled down. We had other things to think about. The reality of shrinking congregations and the presence of the atom bomb were two that come to mind. As a society we still worship the idea, if not always the practice, of building strong healthy bodies of both women and men. But not in churches and not with God as part of the process. Yes, Westminster had a gymnasium. This article marks the end of the three-part series on our gym. Next up will be a series on music in Westminster. This series won’t start to appear till late August / early September.. I would seriously appreciate hearing from anyone out there with experiences. anecdotes, pictures, names to add interest to the story of our long tradition of Music in Worship. Please contact me (royhalstead@shaw.ca). The 25th Anniversary of the Building: A large company in the U.S. had worked out a program that for that time represented a new triumph for the telephone. People far from company headquarters could speak by amplified telephone hook-up to a meeting at the Head office. Our minister, Ernest Marshall Howse, arranged for two previous ministers (Clarence MacKinnon in Halifax and David Christie in Victoria) to preach on a Sunday evening across 4000 miles to their old congregation in Winnipeg. 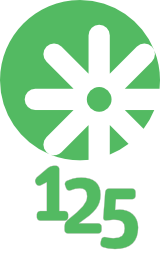 “I rented, in advance, for 20 minutes, the entire telephone system in Canada from Atlantic to Pacific. At the Church we had the telephone receiver amplified by four loudspeakers- each six feet long. Dr. Christie and Dr. MacKinnon sitting by their respective oceans could not see us in Winnipeg and could not hear us. All each knew was that, without cue, each must begin preaching a sermon at an exact moment and end at an exact moment. The service was planned for Sunday evening and the church was crowded beyond capacity. I conducted the service and at the agreed moment I introduced Dr. MacKinnon from Halifax. I was in some trepidation. But I made the introduction and I paused. In seconds a voice familiar to many in the congregation came through those loud speakers and Dr, MacKinnon in Halifax preached to us in Winnipeg. When he had finished I thanked him and introduced Dr. Christie. In a matter of seconds the voice of Dr. Christie came through from Victoria, BC. For Westminster Church it was a momentous occasion. If my memory is right, I paid $85 for that 20 minutes. Such a service had never been conducted in Canada before” — from your 125th Anniversary Committee.